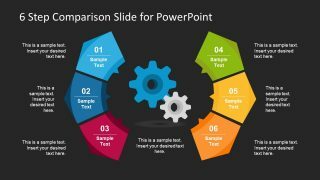 The Free 6 Step Comparison Slide for PowerPoint is an exclusive template design for evaluation and assessments. The template contains an awesome 3 segment comparison diagram for two elements. For example, the contrast between two products, brands, features of a service and specifications list etc. This is a free slide template of 6 step creates a curve around the gears clipart in the middle. This template an incredible way to highlight the advantages of using company’s product while comparing to other brands. Therefore, the slides are useful for demonstrating competition, and market analysis. The colorful presentation PowerPoint has six label designs with text placeholders to write titles. Whereas, these labels have numbers to represent each segment. The Free 6 Step Comparison Slide for PowerPoint is the graphic illustration of comparison table. Therefore, the slide diagrams are reusable in any presentation by simply copying the slide. 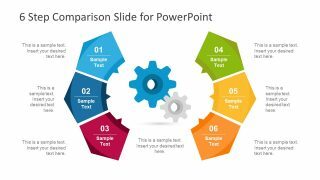 Also, the users can select the individual label shapes of PowerPoint and paste in another presentation. Hence, the free template assists presenter in creative multiple versions of comparison chart by copying individual icons are group image. The slides of 6 step comparison PowerPoint have two background version as a viewing option for presenters. Furthermore, this background option also suggests the ability to change the suitable colors. Additionally, the template offers text placeholders against each label shape and center gear icon to insert important information and notes. The amazing free slides of comparison PowerPoint of 6 step displays a 3D effect through the layer of editable shapes. This template of free PowerPoint is ideal for discussing various diagram graphics. These include pros and cons, arguments of two sides, results of an experiment etc. Moreover, the SlideModel catalog has this stunning template of 6 step modern comparison available for the premium users. The comparison chart design is also useful in product development and feature presentation. Similarly, discuss the comparison matrices and product/services via easy to understand 6 step visual presentation.